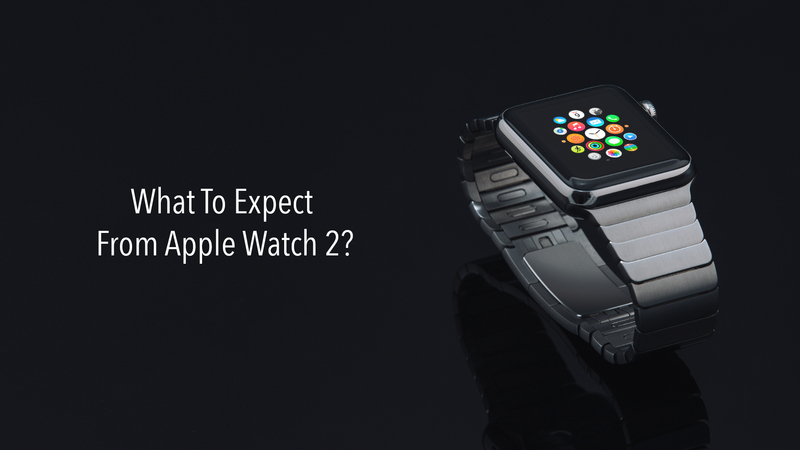 What To Expect From Apple Watch 2? Wider choice – Experts from the field of iOS app development mostly agree that Apple went for marketing its brand in a big way with the introductory Watch version. The company evidently wanted people to put something on their wrists that looked beautiful and ‘different’. While the move generally received the thumbs-up from early adopters, certain minor glitches with the digital crown (in particular) were present. Tim Cook’s ‘one more thing’ is expected to arrive in an array of new materials – like tungsten, platinum and titanium – in its upgraded edition. The price points of the new models will be somewhere around, or a touch above, the $1000 level. Improved wireless functionality – Apple Watch 2 will be a lot less reliant on paired iPhones than its predecessor (third-party app makers can already make native apps for the smartwatch, on the watchOS 2 platform). There will be an additional dynamic chip present in the build of Watch 2 – which will do away with the need for Bluetooth connection while receiving calls directly on the smartwatch. Location-based services will receive a lift from the new chip too, thanks to the smart router triangulation capabilities. With the wifi features on Apple Watch becoming more reliable, general data services and app updates will be smoother as well. A round dial, maybe? – Going by the buzz among mobile app developers and analysts worldwide, Apple Watch 2 might have one (or more) round-dial models as well. The square-faced versions have worked well – but Apple certainly has the chance to offer more form-factor options to buyers (just like it will be doing regarding new materials). When Watch debuted, the focus was, understandably, on branding and product-differentiation. This summer’s Watch 2 is likely to look more like…well…a regular wristwatch. FaceTime calling via Watch – One of the breakthrough new features reported to be present in Watch 2 – although opinions remain polarised as to whether users would be interested in using FaceTime video calling on their wrists. The first couple of prototypes would give us an idea about how the FaceTime camera is placed on the upper portion of the bezel. watchOS 2 already has audio capabilities via FaceTime, and WatchKit app developers are taking that as a tell-tale sign of FaceTime Video arriving on the new version of the Apple smartwatch. 3D Touch to replace Force Touch – Another likely change in the upcoming Watch edition – and a change making that would make it more sensitive and user-friendly. In place of the Force Touch technology on the existing Apple Watch version – which differentiates between 2 different types of touches, the Cupertino company is expected to bring in 3D Touch (which can ‘understand’ the difference between 3 types of touches). Apple has already introduced 3D Touch on the new iPhone 6S/6S Plus handsets – and it’s only natural that the technology will be extended to Watch 2. A slightly better battery life – When considered in isolation, the ‘all day battery life’ of Apple Watch is impressive enough – but it appears somewhat poor when compared to the ten-day battery life that the Pebble Time Steel offers. Watch 2 is rumored to have a slimmer OLED display, and if that actually happens, there will be room for including a larger battery, which would offer a better performance (maybe, just maybe, charging the Watch every day won’t be necessary). If there is indeed an upgrade on the 250/246 mAh battery currently present in Apple Watch, users will be able to wear it while sleeping, and get accurate sleep-tracking data from dedicated apps (like Sleep Cycle). Speedier responses to ‘Hey Siri’ – Right from Apple Maps and HomeKit, to Glances – the sharper artificial intelligence (AI) of watchOS 2 has made many integral features of Apple Watch snappier. iPhone app developers fully expect Siri – the virtual digital assistant – to get a speed boost in the upcoming iteration of the wearable. Improvements are likely in both the processor performance of Siri, as well as its web-based performance. According to many users, Siri on Apple Watch has the potential to become more useful than on iPhone – and Apple would miss a trick if it does not make it a smarter, better assistant. More and better sensors – First, let’s clear a confusion. Apple is working on a full-blown medical device (as reported by Tim Cook to The Telegraph) – but Watch 2.0 is NOT that gadget. However, there will be a slew of new sensors, dedicated to health-tracking, in Apple Watch 2. Apart from stress level trackers, there will be separate sensors for monitoring stuff like blood oxygen and blood pressure. There have been reports of the Watch sensors not working properly for users who had tattoos on their wrists/arms. The revamped sensors in Watch 2 will resolve that problem. Custom-made smart straps – Well, this one is probably the least likely of the features that have made this list. However, there is an outside chance that Apple would introduce Smart Straps for the new version of Watch (just like the ones Pebble smartwatches have). These would open up the opportunity for watchOS app developers to create a wide range of customized straps and bands (LED bands for notifications, battery-straps for greater battery power, etc.). The Apple ecosystem is gradually becoming more ‘open’, and the chance of third-party manufactured smart straps cannot be ruled out. The less power-hungry S2 chip – Another factor that should add some extra battery juice to Apple Watch 2 is the replacement of the existing S1 chip with the more efficient S2 chip. The latter will have Samsung’s 14nm architecture – and hence, will consume less power on average than the 28nm S1 chipset. Techies from the field of wearable technology and mobile app development feel that Apple might use the cutting-edge 14FF process (Foundry) to design the S2 chip. Better waterproofing – The current version of Apple Watch has 1m waterproofing (i.e., IPX7 rating). The results of a recent Wristly Inner Circle survey revealed that, 8 out of 10 Watch-owners considered this to be inadequate. It would hardly be a surprise if Apple Watch 2.0 boasts of greater waterproof rating – enabling users to keep the device on while underwater. The first-generation Watch has done well as a luxury smartwatch – it’s now time for Apple to make it tougher and more damage-resistant. GPS functionality – Since tetherless wifi will almost certainly be present in the new Apple Watch iteration, the chances of it having built-in GPS as well seem slim. Apple can spring a surprise by including GPS-based location services in the new model. That would allow users to keep it on during activities (running, treadmill, etc.) – enhancing the usability of the gadget. What’s more, there is a possibility of the Workout app having manual calibration options. Accurate GPS with real-time information will go a long way in making Watch a comprehensive fitness-tracker device. Personalized watch faces – For all its virtues, the display of Apple Watch is more of a tappable screen, instead of a regular ‘clock face’. WatchKit software and app developers are expecting the Apple designers to do a few tweaks – to provide both users as well as designers access to a larger portion of the overall screen real estate. With Live Photos and Time Lapse videos on watchOS 2, Apple has shown that it is keen to make Apple Watch displays more personalized. Apple Watch 2 will take this further. More of a standalone gadget – As already stated above, the second iteration of Apple Watch will be less dependant on paired iPhone for proper functioning. The new chipset and the robust wifi support will be very important in this regard. Reports from online software and app development forums also suggest that Watch 2.0 will have a ‘Find my Watch’ feature (like ‘Find my iPhone’). Apple won’t bring in Android compatibility to its smartwatch anytime soon – but people will not have to carry their iPhones all the time, for their Watch models to be of any use. Qi charging option – Apple Watch already has wireless charging feature. However, the Cupertino tech giant still has the scope to build on this aspect. A possible option would be the implementation of the Qi charging standard (which is present in the Samsung Galaxy S6). Finding wireless charging pads and hotspots while on the go is becoming increasingly common – and at those places, Qi charging will be more useful than regular wireless charging features. Those who make native software and apps for the iOS/watchOS platform had identified Apple Watch as a gadget that bolsters the Internet of Things (IoT) network (HomeKit was brought under the hood with watchOS 2). More advancements in this regard are expected to be built in Apple Watch 2. The new version is also likely to debut on an upgraded OS version (watchOS 3). Apple might just provide some more storage space in the new models, while significant changes in pricing or designs are not likely. The 2nd-gen Apple Watch is already under development at Quanta – and Apple will probably release a limited edition in June, with a wider launch coming later this year. Let’s wait and find out how many of these expected features it actually comes with.